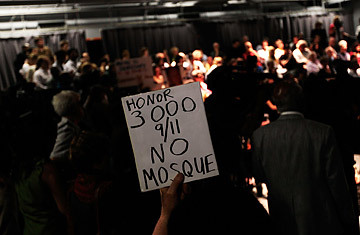 Opponents of the planned Islamic community center and mosque near Ground Zero in lower Manhattan have public opinion firmly in their corner. According to a new TIME poll, 61% of respondents oppose the construction of the Park51/Cordoba House project, compared with 26% who support it. More than 70% concur with the premise that proceeding with the plan would be an insult to the victims of the attacks on the World Trade Center. Opposition to the project appears to derive largely from the conviction that the proposed site of the project  just two blocks from Ground Zero, in a building that formerly housed a Burlington Coat Factory outlet  is so close to "hallowed ground," as President Obama put it. Yet the survey also revealed that many Americans harbor lingering animosity toward Muslims. Twenty-eight percent of voters do not believe Muslims should be eligible to sit on the U.S. Supreme Court. Nearly one-third of the country thinks adherents of Islam should be barred from running for President  a slightly higher percentage than the 24% who mistakenly believe the current occupant of the Oval Office is himself a Muslim. In all, just 47% of respondents believe Obama is a Christian; 24% declined to respond to the question or said they were unsure, and 5% believe he is neither Christian nor Muslim. And while more Americans are open to the idea of having a mosque built in their neighborhood rather than near Ground Zero, it's still not an overwhelming majority; 55% of respondents say they would favor the construction of an Islamic community center and mosque two blocks from their home, and an equal number say they believe most Muslims are "patriotic Americans." As he attempts to shepherd the U.S. through the sluggish economic recovery and galvanize Democratic voters ahead of a congressional election cycle in which the party is expected to sustain heavy losses, Obama's approval rating has held relatively steady, at a near even split: 46% of respondents back his job performance, with 45% expressing disapproval. Voters are far less enthusiastic about the President's policies, however, with 57% asserting that the U.S. is headed in the wrong direction. That wasn't the only grim news for Democrats. The GOP has snatched the lead in generic congressional balloting, with 43% of likely voters saying they would vote for a Republican candidate if the midterm elections were held today, compared with 37% for Democrats. (Last month, Democrats held a slight edge in generic balloting, 43%-42%.) While those figures augur well for the GOP, harping on the mosque issue  a tactic many Republicans appear to have embraced as the overheated debate nears a boiling point  seems unlikely to give the party's fortunes a significant boost. Nearly three-quarters of voters told TIME the issue will not have any impact on their decision in the ballot box. While the poll revealed that prejudice toward Muslims is widespread, respect for other religious traditions remains sturdy. Respondents held the Jewish faith in the highest regard, with 75% professing to hold a favorable impression  just slightly higher than attitudes toward Protestants and Catholics. Fifty-seven percent say they have a favorable view of the Mormon faith, compared with 44% for Muslims. Despite (or perhaps because of) this widespread antipathy, 62% of respondents say they don't personally know a Muslim American. The poll, conducted by Abt SRBI, surveyed 1,002 adults  89% of whom identified themselves as likely voters  on Aug. 16-17.